We woke to a foggy but beautiful morning. Today Damon came back and we were joined by my friend Florian. 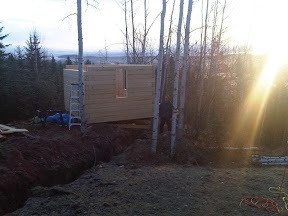 We set the final logs up, placed the porch posts and put up the roof beams. While Damon finished up the logs, Florian and I braced the posts after setting them onto threaded rods. 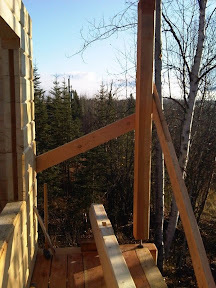 These allow me to adjust their height later, as they are perpendicular to the logs, and though logs will shrink across the grain over time (and drop my walls as much as a few inches) the post won't shorten. Getting that last beam up onto the posts was a little tricky, but we were successful the first try (after measuring many many times on the ground first). 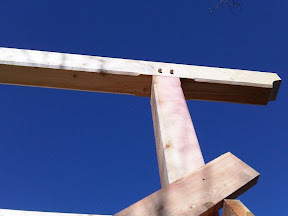 You can see a bit of the cut-out detail on the ends of the beams. 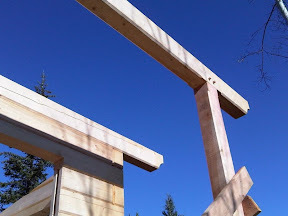 The posts are fastened to the beams with pegs that run through the mortise and tenon.